Myllymatti is a Finnish trick-taking game for three players. A hand of Myllymatti consists of two phases. In the first half of the game, players build their hands for the second half by capturing cards through trick-taking. The players then take the hands they built to the second phase and try to get rid of their cards as fast as they can. Myllymatti is the oldest of a family of games played across the Scandinavian countries. It originated in the early 1800s in what is now western Finland, with photographic evidence of the game dating back to 1907. From Finland, it spread west, evolving into a different game in each country it entered. In Sweden, it became the very similar Skitgubbe. In Norway, it evolved into the game of Mattis. Back in its native Finland, it spawned yet another variation, for up to eight players, named Koira (a name that is sometimes used interchangeably with Myllymatti), which plays quite similar to Mattis. The object of Myllymatti is to capture powerful cards through trick-taking. Then, the player uses these cards in a second round of trick-taking, with the ultimate goal to avoid being the last player with cards. To play Myllymatti, you’ll need a standard deck of 52 playing cards. 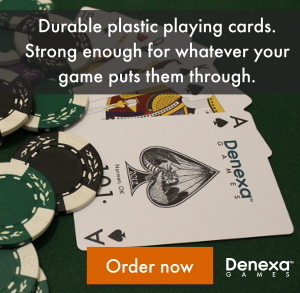 We, of course, recommend using Denexa 100% Plastic Playing Cards at all times. Shuffle and deal three cards to each player. Place the stub face down in the center of the table, forming the stock. The player to the dealer’s left leads to the first trick. The next player to the left then responds with any card they wish (there is no requirement to follow suit). Each trick is played with only two out of the three players; the third player (in the case of the first trick, the dealer) does not contribute to the trick. Whoever plays the higher card, according to the usual order of card rankings, wins the trick. Suits do not matter. Whichever player wins the trick takes the two cards and places them into a face-down won-cards pile in front of them. Both players that participated in the trick draw a card from the trick, restoring their hand to three cards. The winner of the trick then leads to the next one, playing against the player to their left. When the two cards played to a trick tie, it is called a bounce. The cards comprising such a trick are left on the table. The same player then leads to the next trick. This continues until a player actually wins the trick. That player takes all the cards on the table. As long as there is more than one card left in the stock, a player may choose to turn its top card up and use this as their play. Turning a card from the stock commits to playing it; it cannot be taken into the hand and another card played instead. When a player would be required to draw the last card from the stock, rather than adding it to their hand as usual, they show it to the other players. The suit of this card will become the trump suit for the second half of the game. The player that drew the card then places it directly in their won-cards pile without adding it to their hand. The players continue playing tricks until a player has no cards to play on their turn. Any cards that were played to a trick in progress are added to the won-cards piles of the players that played them. Remaining cards in the players’ hands are then exposed and placed in the won-cards piles of the players they belong to. The cards in each player’s won-cards pile form their hand for the second phase of the game. Whichever player drew the last card from the stock (the card that fixed the trump suit) leads to first trick. Players are now required to beat the last card played, if possible. A card can only be beaten by a higher card of the same suit, or a trump (trumps can only be beaten by higher trumps). If a player is unable or unwilling to do so, they take the last card played into their hand, and play passes to the left. 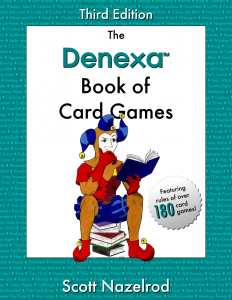 A trick is considered complete when it contains the same number of cards as there were players in the game at the start of the trick. When a trick is complete, the cards are discarded, and the last player to play a card (and thus the one who played the highest card) leads to the next trick. A trick can also come to an end by all of its cards being picked up; in this case, the player to the left of the last person to take in a card leads to the next trick. When a player runs out of cards, they drop out of the game. Game play continues until only one player is left with any cards. That player loses the game.